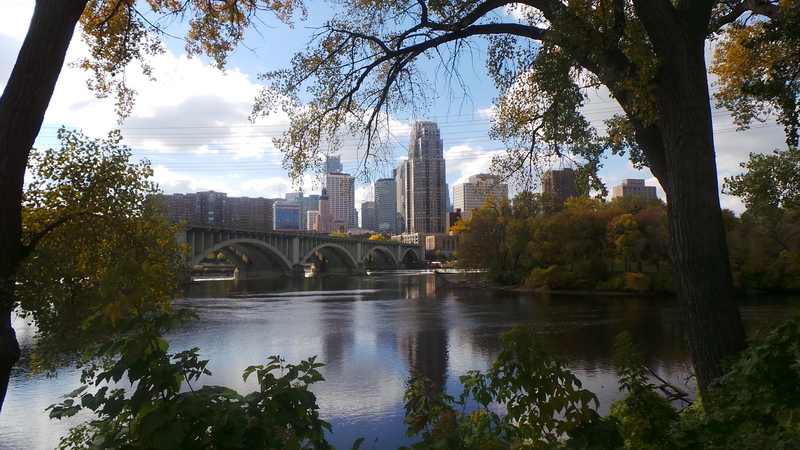 ELUNA 2015, along with the Ex Libris Technical Seminar, will take place in downtown Minneapolis May 4-8 in a single location, the Minneapolis Marriott City Center. 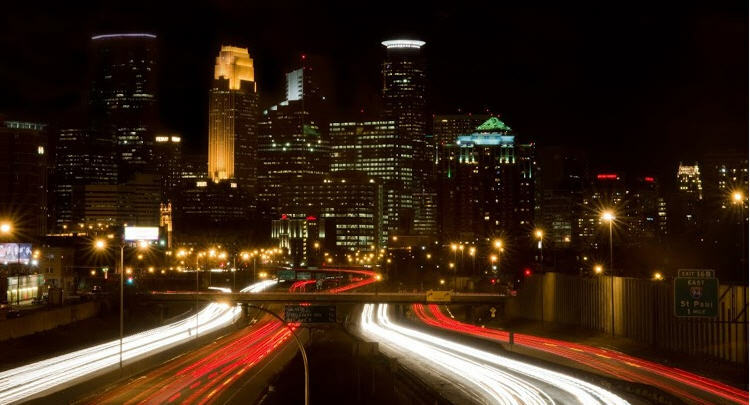 Minneapolis is known for its many lakes, parks, and walking and biking trails within the city limits; its arts, music and theater scene; and its extensive downtown skyway system. Weather this week: high 60s to 80, chances of rain. Please pick up your prizes before Friday at noon. Keep your tickets! Prizes not picked up by noon are available for a second drawing. Maria Keller is a local 14-year-old who wants to make a difference. She began Read Indeed at age 8 with a goal to collect and distribute one million books to kids in need before she was 18. Maria accomplished this before she was 13, touching the lives of hundreds of thousands of children. She is now working to distribute two million books in all 50 states and every country in the world. You can contribute to Maria’s efforts by participating in our raffle or with a cash and/or book donation at the registration desk, or by contributing directly via the Read Indeed website. Thank you! Read Indeed is a 501c3 nonprofit literacy organization. Read Indeed raffle details: Raffle tickets are $1 each. Among our fabulous Minnesota-made prizes are: several gift packs (Spam!, Nice Ride, Charles Schultz/Peanuts, Minnesota Twins, Summit, Bob Dylan, Prince, NordicWare, Caribou Coffee, and University of Minnesota); Wilson’s leather messenger bag; wines; hand-crafted jewelry; and candy. Raffle drawing is Thursday at noon. Winning numbers will be posted at the registration desk and on this web page. Prizes must be picked up by Friday noon. Any remaining prizes will be eligible for a second drawing at conference closing. Arriving by train: The Amtrak Empire Builder arrives at the Union Depot in St. Paul. From there, take the light rail Green Line to downtown Minneapolis (see payment info above). Getting from light rail to hotels: Exit the train at the Nicollet Mall Station, about 2 blocks from both conference hotels. To get to the Marriott City Center, turn right when exiting the train. At end of platform, turn left at Nicollet Mall to cross 5th Street. Cross Nicollet, turn left and walk 2 blocks. Turn right on 7th Street and walk about 1/2 block to the Marriott at 30 South 7th. Hotel check-in is on the 5th floor. Conference registration is on the 4th floor. To get to the Crowne Plaza Northstar, turn left when exiting the train. At end of platform, turn right at Marquette to cross 5th Street. Cross Marquette and continue on 5th for one block. Turn right on 2nd Avenue and walk about 1.5 blocks to hotel at 618 2nd Avenue South. Check-in is on first floor. By street: From the Crowne Plaza 2nd Avenue entrance, turn right and walk a few yards to 7th Street. Turn right on 7th and walk 2.5 blocks to the Marriott entrance at 30 South 7th Street. Take an elevator to the 4th floor for conference registration/check-in. By skyway: Exit Crowne Plaza near the check-in desk and take the escalator on left of food court. At top of escalator, take two rights. At Sorrento Cucina, go left, then right up the stairs, then left into the skyway to Wells Fargo. Walk through Wells Fargo into Gavidae Common, turn left just past the escalators, then right to the skyway to City Center. Follow the Marriott signs to the hotel’s 7th Street escalators. Take an elevator to the 4th floor for conference registration/check-in. All conference sessions are held at the Minneapolis Marriott City Center, located in the center of downtown Minneapolis and within easy walking distance of many restaurants, theaters, and shops. When walking on the streets, look for Downtown Improvement District staff (in lime green and royal blue uniforms with the DID Minneapolis logo), who will assist you with directions and recommendations. The Marriott is also connected to the skyway system, enclosed pedestrian walkways connecting buildings in downtown Minneapolis. Free bus rides: Take any bus marked “Free Ride” to go north or south on Nicollet Mall. 50 cent rides within the Downtown Zone: Buses: Before paying your fare, tell the driver that you will be riding only within the Downtown Zone. Light rail: Buy a Downtown Zone ticket at the ticket machine. Transfers are not available with Downtown Zone fares. Nice Ride bike sharing: Purchase a 24-hour bike pass at any Nice Ride station for $6. As long as no individual trip lasts longer than 30 minutes, there are no extra charges. The station closest to our hotels is at the IDS Center on 8th Street between Nicollet and Marquette. Maps and more information are available at the registration desk, or see www.niceridemn.org. There are several Minneapolis maps at this site: http://www.minneapolis.org/visitor/map-transportation/maps See https://www.metrotransit.org/ for more transit information. Tuesday evening: The opening reception begins at 6:00 p.m. at Aria, a beautiful 1896 National Historic Register building. There will be cold beverages and good food. Shuttle service between the hotel and Aria will be provided, or if you prefer, you can walk the 3/4 mile. Wednesday, Thursday, and Friday mornings: Start your day with skyway aerobics, a group walk through the Minneapolis skyways. We will leave at 7:30 a.m. sharp each day from the Marriott 4th floor registration desk. It’s a great way to wake up, get a bit of exercise (but not too much), and learn your way around the skyways. We’ll return to the hotel by 8:00 a.m.
Join a group for the 7:10 Minnesota Twins/Oakland Athletics baseball game at Target Field, two blocks west of the Marriott. Our 60-ticket block is sold out, but anyone can still sit with us by joining us at the registration desk at 6:15 to walk to the ballpark together. Contact Sue Koelmel for more information. Join our local guides for a visit to nearby Fulton Brewery. Leave from the Marriott 4th floor registration desk at 7:00 to walk together, or join the group at Fulton at 7:30. Have dinner at one of the many restaurants in the area before your visit, or order restaurant food at the brewery. Sign up for this event at the registration desk during the conference. Contact Chris Rose. Thursday evening: The networking dinner, from 7:00 to 10:00, is at The Venue, a 1/2 mile walk from the Marriott. If you did not purchase a dinner ticket with your registration, they may still be available at the registration desk at $35 for attendees and $40 for guests. Restaurants: We don’t want you to starve in downtown Minneapolis. The Marriott Restaurant & Bar Guide: brief descriptions, price ranges, map. U of M Libraries Staff Recommendations: links, distance from Marriott, comments. The Guthrie Theater is a little over a mile from the Marriott; take the Green Line or Blue Line to the Downtown East station for 7 blocks of the distance. The four theaters of the Hennepin Theatre Trust are within two blocks of the Marriott on Hennepin Avenue; the New Century Theatre is inside City Center. The Illusion Theater is at 528 Hennepin. The History Theatre in St. Paul is on the Green Line. 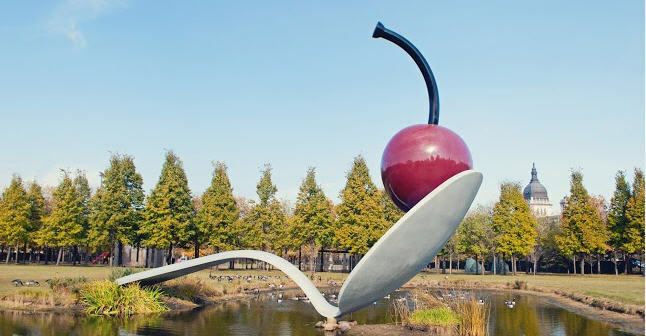 The Walker Art Center has an indoor indoors and outdoor sculpture garden. Gallery is free Thursday evenings 5:00-9:00. Take any #6 bus going south. 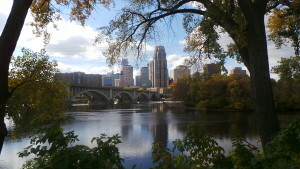 The Minneapolis Institute of Arts is about 2 miles; the #18 bus takes you within 2 blocks. The Mill City Museum is near the Guthrie, a little over a mile from the Marriott. Take the Green Line or Blue Line to the Downtown East station for 7 blocks of the distance. Open until 5:00 Tuesday through Sunday. The University of Minnesota’s Weisman Art Museum is close by on the Green Line, about halfway between the West Bank and East Bank stations. The César Pelli designed Minneapolis Public Library is at Nicollet and 4th Street. The University of Minnesota is close by on the Green Line (West Bank Station or East Bank Station). The Mall of America is a 45-minute trip on the Blue Line. Marriott: Drop off your luggage at the Elite desk to the right of to 5th floor check-in. Crowne Plaza: Drop off your luggage at the check-in desk. From the Marriott 7th Street entrance, go left on 7th, then left on Nicollet, and walk 2 blocks to 5th Street and the Nicollet Mall Station platform. From the Crowne Plaza 2nd Avenue entrance, turn left and walk down 2nd Avenue to 5th Street. Turn left on 5th and walk one block to Marquette and the Nicollet Mall Station platform. Fare is $1.75 or $2.25, depending on time of day. Pay at the ticket machine before boarding the train. They accept credit cards, coins and $1 to $20 bills. Change, up to $19.50, is in dollar coins and quarters. Taking light rail to the airport: Take the Blue Line (Mall of America) train. Exit at Airport Terminal 1 (Lindbergh) or 2 (Humphrey), about 25 minutes from the Nicollet Mall Station. Taking light rail to Amtrak: Take the Green Line (St. Paul) train to the end of the line, Union Depot and Amtrak station, about 50 minutes from the Nicollet Mall Station.